Valemount is a village in eastern British Columbia surrounded by tremendous beauty, but unlike towns similarly endowed and just a hundred kilometers away in the national parks, the village has only pursued tourism in the last 20 years. There is no question that Valemount is beautiful. It is at the confluence of three mountain ranges and not too far from the foot of Mount Robson, the highest peak in the Canadian Rockies. Scale any mountain around Valemount and the tiny settlement recedes into a small patch of cleared forest; and the mountain ranges that make up our corner of the world rise up. It’s a beautiful place to be, but Valemount wasn’t founded for its beauty. Valemount developed around the rail road in the early twentieth century and residents made their living in forestry. In Valemount’s early life many small mills prepared timber for railroad ties; small operations create poles and of course, lumber. Later, that industry would centralize around a single major mill. Wages and working conditions improved, but the days of quitting a job in one mill and showing up at the next became a thing of the past. In Valemount forestry peaked in the mid-90s when the community boasted a thriving mill. It was modern enough to be competitive and had a companion logging industry that employed many. The village had as many as 1400 residents at its peak and about 20% were directly employed by a single employer – the mill. The mill sawed its last board in 2006, and as if to steal the last hope of any believers, the mill was dissembled piece by piece in 2009. Who was to blame? Many things undermined the business case for a single large mill in Valemount: rising fuel costs, global competition, expensive hillside logging, outdated equipment, a rising Canadian dollar and the softwood lumber dispute. A massive change in provincial policy that allowed mill owners to ship wood as far away as they wanted was the final death blow to the single mill model in Valemount. 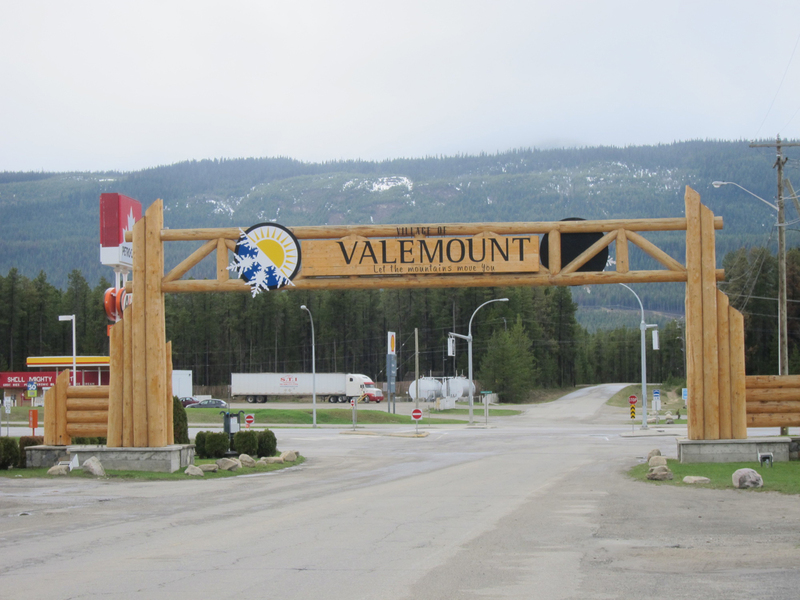 Valemount has long understood itself to be a centre of industry. Forestry continues to be an important player in the economy to this day, but few can argue forestry is more than just one in a constellation of industries that make a contribution. That Valemount could continue to exist without its largest employer was a surprise to many of us. Unlike many resource towns that pack up when the mill or mine closes, Valemount persists. The community, as it turns out, is deeply resilient. Though the population dropped by 200 people between the 2001 and 2006 census, the population since 2006 has remained stable. What does Valemount have that has kept the population here? It is tough to say exactly why one thousand souls have chosen to stay regardless of tough economic times, but being surrounded by beauty couldn’t have hurt the case. The community has a relaxed pace. Community bonds are forged between people with an appreciation of where they live, despite the hardships that come with it. It seems that people work hard to continue living in this community. Not everyone has been able to stay, so the privilege of living here is something few of us take for granted. After the mill closed there weren’t a whole lot of fantastic jobs that could support an entire family, but the few high paying jobs that did come up were hotly contested by folks looking to move up or move in. To this day good jobs in the public service, whether at the fire base, health centre, police station or the village are still hotly contested by typically over-qualified folks looking to move to, or stay in Valemount. Beyond these economic migrants you can find stranger birds still: people who have moved here from across the province, country or globe on impulse, smitten by the mountains and community. They came here first and looked for work as an afterthought. If you have been in town on a fine clear day you may have felt that pull too. Building the infrastructure for amazing mountain experiences isn’t a new idea in Valemount, but in the early 2000s many in the community viewed a move towards tourism as a sort of existential threat to highly paid skilled work at the mill. As the community’s economic driver failed, tourism, at least as a replacement for good work at the mill, was disdained. Mill workers didn’t see the kinds of opportunities created that would sustain families or pay mortgages. But as the community struggled through the mill closure, it became clear that at least some of the remaining high paying jobs were sustained by tourism indirectly. So while not everybody in the community wanted to be a short order cook or waiter, the cook and waiter’s family was indeed keeping teachers teaching. For the most part that view of tourism as ‘either or’ has changed. A case for developing tourism assets can be made by looking at the motivations for young returning families. Thirty somethings are starting to find their way back to the community in search of a high quality of life. Part of that life includes having access to amazing mountain amenities. Amenities like mountain biking trails, backcountry skiing and snowmobiling attract them. As economic organizations in the community work to re-imagine the local economy these recreation amenities help existing entrepreneurs find employees and help attract new entrepreneurs to the area. The same amenities that attract tourists attract and retain employees and young entrepreneurs. The Valemount Community Forest was established in 2009 and in late 2014 it acquired the old mill site property. Now they are in the midst of establishing an industrial site for small to medium size enterprises. The timing couldn’t be better. One of the key questions prospective tenants have asked is, “Will I be able to keep employees here?” It’s a question we have no trouble answering. Valemount Glacier Destinations, a proposal which would bring people to the top of a glacier covered mountain, is not the only example of the development of new tourism amenities. The local outdoors club has been working on a major new mountain bike trail system, and its first phase will be completed this summer. Recently the motorized outdoor recreation society created a first of its kind snowmobile assisted ski hill. Other groups have built and have been sustaining amazing cabins in the back country for years. Perhaps building a mountain resort is just one example of a whole suite of examples where the community is developing the economy to match our resources. What local people decide to do with any of these new opportunities is an open question. But that these opportunities occur in a beautiful mountain town of made up of committed, rooted people certainly bodes well for the future.